I was in Brownfield, Texas, on a Sunday morning, doing my thing – checking out stuff downtown. I found the vacant movie theater, and shot a photo through a broken window to get the interior. Then I turned around, and let my gaze track across the marquee that jutted over the sidewalk. Two-thirds of the way across it, I saw this cat, just chilling in the joists. I was a lot less chill when I spotted her, but after I got over the initial surprise, I laughed. Then I made a photo. 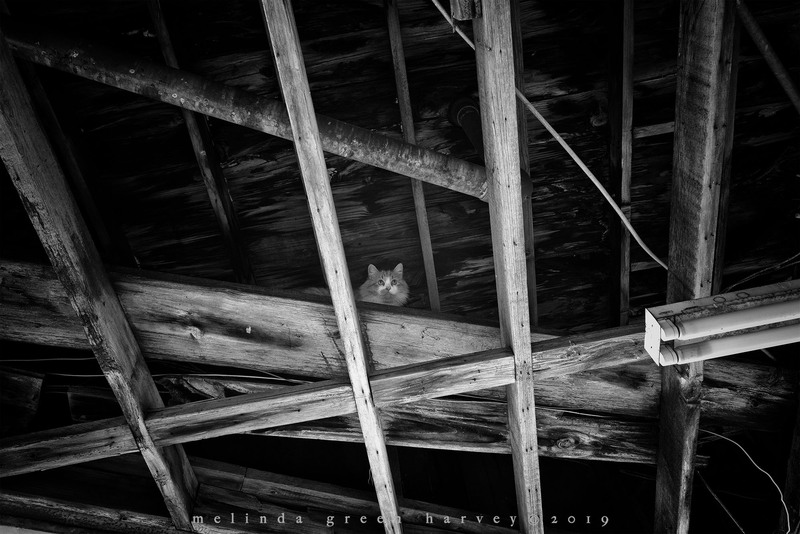 Posted on February 11, 2019, in Photography and tagged 365 photo project, abandoned buildings, black and white photography, brownfield, brownfield texas, cat, downtown, learning to see, Leica, melinda green harvey, monochrome, one day one image, photo a day, photography, postaday, rafters, road trip, texas, thoughtful seeing, travel photography. Bookmark the permalink. 9 Comments. Will we see more of that theatre?? Oh, shame….you’ll have to go back!! Perfect! I want to know what you think! Talk about framing! I like this a lot, Melinda. Thanks, Linda. I love how the cat was pointedly NOT LOOKING at me when I made the picture!